Hotel Packages to Fernando de Noronha, Brazil . Book your hotel package to Fernando de Noronha with the Island Experts. Customize your itinerary. Combine your visit to Noronha with other cities in Brazil. Most tourists come to the island to enjoy the beaches and its surrounding aquatic wildlife. There is much to offer the visitor both on land and in the water. Families would do well to visit Baia do Sueste with its calm waters and prime snorkeling. If you do not fear heights climb down the 100ft iron ladders bolted into a cliff to reach Baia do Sancho, one of the most beautiful beaches on the island. A lucky few, sans suntan lotion, can enjoy the low tide pools filled with exotic fish at Praia do Atalaia. Many visitors come to Fernando de Noronha for the surfing. The best surfing beaches face Brazil. These beaches include Praia do Bode, Praia do Cachorro, Cacimba do Padre, Praia do Boldro, Praia do Meio and Praia da Conceicao. Be careful as the current is very strong and can sweep you away. There are also 3 dive stores on the island. 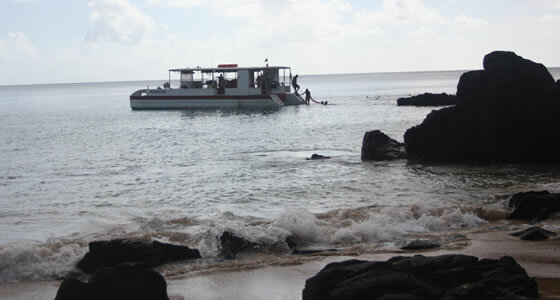 Aguas Claras, Atlantis Diver and Noronha Diver all offer diving expeditions as well as instructions. There are plenty of tours to enjoy on the island. Travelers can go and see the dolphins at sunrise, take a walking tour around the island, or visit Atalaia beach. A very popular activity is water-boarding. A fast motorboat pulls you on a board or piece of plastic. By angling the board down you can dive underwater and then shoot back up by angling the board toward the surface. There are several trails in the national park to enjoy or visitors can hike above Praia do Leao considered the most beautiful beach on the island. Horseback riding and mountain biking are also available. Sea kayaking tours leave from Porto Santo Antonio for a 3 hour trip along the coast.